Two points about young people living in smallholder households: They tend to save more money than their elders and they have mobile phones. And yet, formal financial services providers (FSPs) are not reaching them. 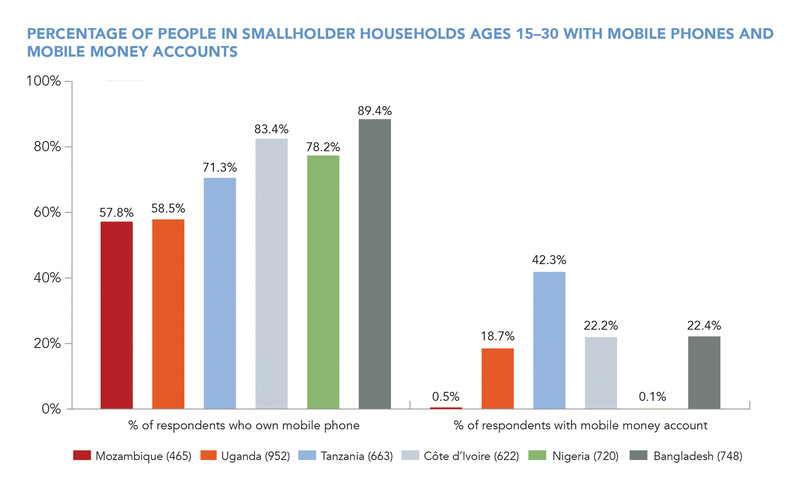 Young people in smallholder families use mobile money at lower rates and tend to rely on informal mechanisms to set aside money (e.g., saving at home, savings and credit groups, transacting with friends and family). The youth market in smallholder households is meaningful. In Tanzania, for example, 7.6 million young people 15 to 30 years old live in smallholder households, and 1.8 million of them own a mobile phone but not a mobile money account. This in and of itself is a big market of potential mobile money clients who could be transferring money as well as buying airtime, ringtones, and other fee-based services. CGAP data indicate that they would also be putting aside meaningful amounts of money. If, for example, these 1.83 million young people in Tanzania were to each save US$174 per year (i.e., the average annual savings of youth in the Tanzania smallholder diaries sample), then over US$318 million could be mobilized through financial channels every year. Forward-looking FSPs will begin serving this untapped market of young people in smallholder families and investing in what could be a long-term customer relationship. After all, today’s young people are tomorrow’s entrepreneurs and workers, community leaders, and household elders, and the next generation of their clients. Feature image photo by Hailey Tucker, 2015 CGAP Photo Contest.